The 2016 Ford Escape is a favorite for both families and commuters. Find out what makes the Escape so versatile in the Edmund’s Expert Review. For the 2016 Ford Escape, a new touchscreen infotainment system called “Sync 3” replaces the much-maligned MyFord Touch, while the standard audio system loses its auxiliary input jack. Compact crossover SUVs are great for many things, be it commuting to work, taking your kids to school, loading up goods from Costco or going on a ski trip. Often lacking, however, is any sense of fun. 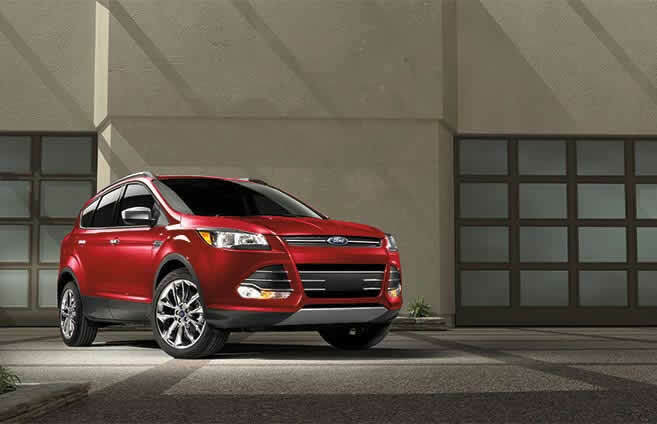 To get that, you’ll want to check out the 2016 Ford Escape. 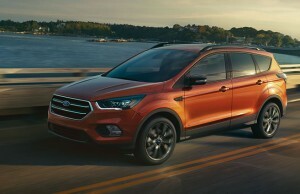 Based on the engaging Ford Focus, the current Escape drives like a Focus on its tiptoes (that’s a compliment) and, when fitted with the turbocharged 2.0-liter engine, it’s one of the quickest small crossovers in this price range. Moreover, the Escape earns its crossover stripes with optional all-wheel drive, respectable fuel economy, a spacious cargo bay and an available hands-free power liftgate with a super-cool foot sensor. One of our few issues with the current-generation Escape has been the finicky operation of its optional MyFord Touch infotainment system, built with Microsoft know-how but plagued from birth by significant usability issues. Happily, the 2016 Escape gets a clean slate with the introduction of the BlackBerry-powered Sync 3 system, whichFord says has quicker response times and a simplified menu that appears as a strip at the bottom of the central touchscreen. 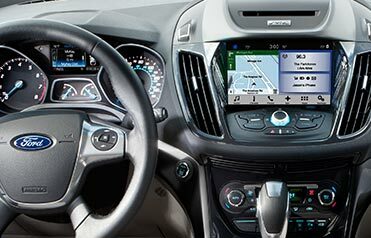 Sync 3 also features intuitive pinch-and-swipe functions, just like a smartphone, while matching the feature-rich excellence of MyFord Touch. Time will tell whether it’s a bigger hit with owners, but based on our initial impressions, it seems to be a real step forward. Whether or not you opt for Sync 3, the Escape will treat you to one of the better cabins in the compact crossover segment, highlighted by premium materials and generous standard items like a rearview camera, USB connectivity and truly useful voice controls. Having said that, we’re not enamored of the standard infotainment system, which consists of a humble 4.2-inch central display and twin banks of form-over-function buttons laid out in a V-shaped pattern. No matter; once you hit the road, you’ll quickly realize that the Escape is extraordinarily rewarding to drive. Agile yet refined, it instills a level of driver confidence that’s quite rare in this class. It’s not unparalleled, however. The sporty and efficient 2016 Mazda CX-5 matches the Escape on most fronts, particularly with its updated, knob-based infotainment interface. We also recommend the Edmunds “A”-rated Honda CR-V and Toyota RAV4. Unlike the Escape, they don’t offer multiple engine options for buyers who want a performance upgrade, but they’re exceptionally easy to drive and have roomier seating and cargo areas. The Hyundai Santa Fe Sport is worth checking out, too, as a slightly larger alternative with a peppy optional turbocharged engine that rivals the Escape’s top-of-the-line 2.0-liter turbo. But the 2016 Ford Escape remains a smart choice in this segment due to its exceptionally well-rounded skill set. 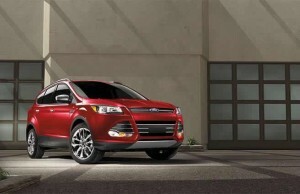 The 2016 Ford Escape is a compact crossover SUV that comes in three trim levels: S, SE and Titanium. Standard features on the S include 17-inch steel wheels, an integrated blind-spot mirror, MyKey parental controls, full power accessories, keyless entry, cruise control, air-conditioning, a tilt-and-telescoping steering wheel, a height-adjustable driver seat, a 60/40-split folding and reclining rear seat, a 4.2-inch central display, a rearview camera, the Sync voice command electronics interface with AppLink smartphone integration, Bluetooth phone and audio connectivity and a six-speaker sound system with a CD player and a USB port. Upgrading to the SE adds 17-inch alloy wheels (optional on S), the 1.6-liter turbocharged engine, automatic headlights, foglights, a keyless entry keypad, rear privacy glass, an eight-way power-adjustable driver seat (with power lumbar), upgraded cloth upholstery, a rear center armrest and satellite radio. The optional SE Convenience package adds roof rails, rear parking sensors, dual-zone automatic climate control, a 110-volt household-style power outlet, the Sync 3 technology interface (including an 8-inch touchscreen) and a nine-speaker sound system with dual USB ports. The SE Leather Comfort package contributes heated mirrors, leather upholstery and heated front seats. You can also get the heated seats and mirrors, plus a windshield wiper de-icer with the Cold Weather package. Also available are a power liftgate (requires SE Convenience package), 18-inch wheels and remote ignition. At the top of the line, the Titanium combines the SE packages and options listed above with an exclusive foot sensor for the power liftgate, keyless entry and ignition, ambient interior lighting, an eight-way power-adjustable passenger seat (with power lumbar), driver memory settings, an auto-dimming rearview mirror and a 10-speaker Sony audio system with HD radio. Titanium options include a Technology package (xenon headlights, blind-spot monitoring, rear cross-traffic alert, automatic wipers and a self-parking system) and 19-inch alloy wheels. 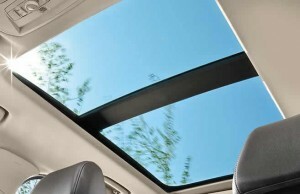 Optional on both SE and Titanium are a panoramic sunroof and a navigation system. A 2.5-liter four-cylinder engine with 168 horsepower and 170 pound-feet of torque is standard on the S and a cost-reducing option on the SE. AWD is not offered with this engine. Fuel economy estimates are 25 mpg combined (22 city/31 highway). The SE and Titanium come standard with a turbocharged 1.6-liter four-cylinder that makes 178 hp and 184 lb-ft of torque. In Edmunds performance testing, an Escape 1.6 FWD went from zero to 60 mph in 8.7 seconds, which is slightly quicker than average for a small crossover with a base engine. Fuel economy with the 1.6 stands at 26 mpg combined (23 city/32 highway) with FWD, dropping to 25 mpg combined (22 city/29 highway) with AWD. Optional on the SE and Titanium is a turbocharged 2.0-liter four-cylinder that pumps out 240 hp and 270 lb-ft of torque. In Edmunds testing, an Escape 2.0 AWD accelerated to 60 mph in a quick 7.0 seconds. Fuel economy rates 25 mpg combined (22 city/30 highway) with FWD and 23 mpg combined (21 city/28 highway) with AWD. 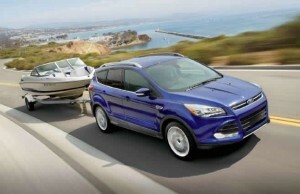 Properly equipped, an Escape with the 2.0-liter engine can tow up to 3,500 pounds. In Edmunds brake testing, an Escape SE 1.6 came to a stop from 60 mph in an admirably short 115 feet. In government crash tests, the Escape earned an overall rating of four stars (out of a possible five), with four stars for total frontal-impact crash protection and five stars for total side-impact protection. The Insurance Institute for Highway Safety gave the Escape a top score of “Good” in its moderate-overlap frontal-offset, side-impact and roof-strength crash tests. The Escape’s seat and head restraint design was also rated “Good” for whiplash protection in rear impacts, but it received the lowest score of “Poor” in the small-overlap frontal-offset crash test. In spite of the Escape’s compact appearance, it’s pretty spacious behind the front seats. Although the reclining backseat isn’t as airy as some rivals, it gives adult passengers adequate legroom and plenty of headroom. On the hauling front, the cargo area measures a competitive 34.3 cubic feet, and the squared-off roof line allows bulky items or big dogs to fit pretty easily. Flipping the rear seats down via the handy one-touch lever opens up 68.1 cubes of space, a satisfactory number for the segment. The hands-free power liftgate is a nifty feature, opening with a wave of your foot under the rear bumper (as long as you have the key somewhere on you), but you can only have it if you spring for the pricey Titanium trim. With its quick, precise steering and relatively sharp reflexes, the 2016 Ford Escape is one of the segment’s top athletes. Some compact crossovers feel tall and bulky from the driver seat, but the Escape just feels like a sporty hatchback with a higher center of gravity. The driving position is also elevated, of course, so you get that SUV-style commanding view of the road, yet the Escape remains firmly planted to the pavement during quick transitions. Fortunately, this dynamic character doesn’t come at the expense of ride comfort, which is exemplary by class standards. Performance ranges from average with the 2.5-liter and turbocharged 1.6-liter engines to downright spirited with the turbocharged 2.0-liter unit. Although most owners will likely be content with the 1.6-liter turbo’s acceleration and fuel economy, it’s hard to resist the 2.0-liter turbo, as it delivers much more capability with only a modest reduction in fuel efficiency. Even if you don’t have a heavy foot, you’ll notice that the 2.0 pulls effortlessly up steady grades, whereas the 1.6-liter requires more frequent downshifts from the automatic transmission to stay on pace. The good news is that both turbocharged engines are equally quiet and smooth.